Walking and cycling are getting more and more attention in wealthy cities, as ideas about pedestrianization and safer street designs grow in popularity. Walking and cycling produce the least pollution of any urban transport mode, foster health benefits, decrease traffic congestion, and can help address traffic safety by protecting vulnerable users. But in many of the fastest growing cities in the world, people walk or bicycle out of necessity. Walking and cycling levels in low- and middle-income countries are on par with or surpass those of public transport. In most Latin American cities, walking and cycling comprise 30 to 40 percent of all trips. Some 2.5 billion people are expected to be added to cities by 2050, most in low- and middle-income countries. Chances are, many millions more will walk or cycle to their homes, jobs and friends every day in the years ahead. Yet there is a mixed record of addressing these important modes of transport in global development agendas. The New Urban Agenda, launched at the Habitat III summit last year, mentions walking and cycling 10 times – a welcome change compared to previous iterations, which mentioned them just once. But there is no direct reference to them in the Sustainable Development Goals (SDGs) and only passing reference in climate targets and other major global policy agreements. Despite this, governments interested in the benefits of urban walking and cycling will find they fit well under several existing elements of the global agenda. There are clear ways that supporting walking and cycling contributes to development objectives. The SDGs contain two goals that primarily relate to walking and bicycling: Goal 3, to foster good health and well-being; and Goal 11, to provide sustainable cities and communities, as well as connections to sustainable infrastructure, gender and climate change. For example, safety of pedestrian and cyclists will be necessary to meet the road safety target to halve road deaths, and walking and cycling also provide an easy form of physical activity that positively contributes to health. 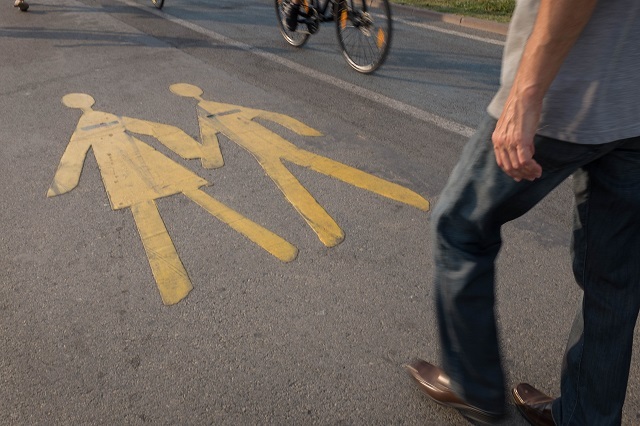 Providing safe public spaces that are accessible to all will entail making cities bicycle and walking friendly, and these modes have a clear connection to addressing climate change. Additional connections can be inferred through goals for sustainable infrastructure and climate change. The New Urban Agenda is the outcome document agreed on at the Habitat III conference in Quito, Ecuador in 2016. It is expected to guide urban policy for countries, cities, international development funders, UN programs and civil society for the next 20 years. Contrary to the outcome of the previous two Habitat agendas in 1976 and 1996, which mention cycling just a single time, the New Urban Agenda mentions cycling five times and walking or pedestrians an additional five times. Citiscope further notes that unlike in the SDGs, cycling and walking are “explicitly promoted and implicitly encouraged through an overall emphasis on human-scale and people-centered planning.” This includes fostering road safety, particularly for school children, encouraging accessible public space for walking and cycling, and supporting sustainable mobility that explicitly includes walking and cycling. 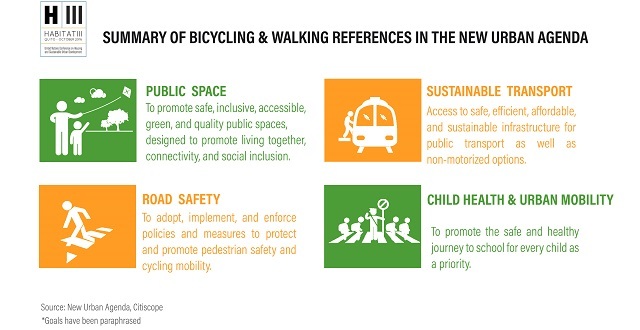 In addition, promotion of safe walking and cycling are significant aspects of other global efforts, such as the Global Action Plan for the Prevention and Control of Noncommunicable Diseases and the UN Decade of Action on Road Safety. There’s also the Paris Agreement and potential for more climate connections. 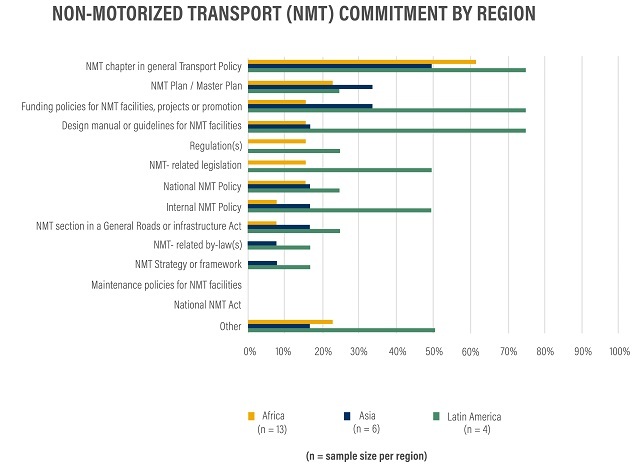 Although the agreement itself does not specifically reference transport, countries have committed to Nationally Determined Contributions (NDCs) that indicate what they will do to meet global emissions targets. A review by SLoCaT found that 74 percent of the NDCs submitted so far mention urban transport, though only 14 percent specifically reference walking and cycling. Mere mention of walking and cycling in a document does not make for real progress for commuters and residents and businesses. The UN Environment Programme report recommends countries draft and implement national and local policies, dedicate at least 20 percent of transport budgets to walking and cycling infrastructure, gather better data, and address concerns of key users such as women, children and the elderly. Overall, they recommend cities and national governments give walking and cycling equal status to that of private cars. 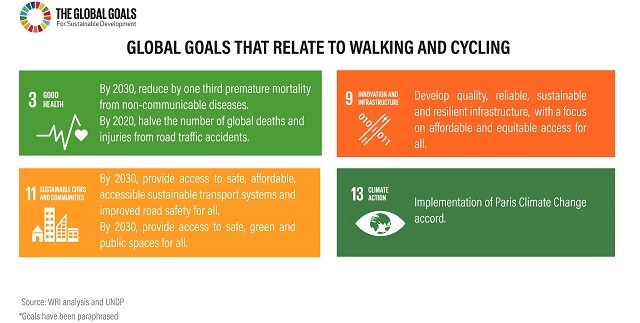 Though a higher profile in the SDGs would have been welcome, the global agenda contains more to support walking and cycling than any other time. As this year’s climate conference showed, the emphasis for many global development agendas is now shifting from commitment to action, and the same is true for walking and cycling. It will likely require country and city-level actors to take charge and emphasize walking and cycling in planning and budgeting. Ben Welle is a Senior Associate for Urban Mobility at WRI Ross Center for Sustainable Cities. Nikita Luke is a Sustainable Transportation Intern with the Health and Road Safety Program in Washington, D.C.